The collaborative and creative process is a wonderful place to work and it's an amazing thing and a privilege to go into a studio or on stage with a talented artist, group or client and create something that wasn't there before. The key to doing a great job is to love what you do and to bring that excitement and positive energy to work with you each day. When that is done, everyone reacts in kind, and the end result benefits in obvious ways. When considering new artists to work with we look for that passion and desire and feed into it and off of it. - Spyros Poulos, Owner, Logic Music Inc.
Spyros Poulos and company Logic Music Inc. have produced, directed, recorded, performed, participated and collaborated in thousands of music and audio productions over the years. In studio and on stage Spyros Poulos has worked with and for a diverse array of recording artists such as Madonna, Billy Joel, Trans Siberian Orchestra, Al Di Meola, Celine Dion, George Dalaras, Paul Anka, Peter Allen, Debbie Gibson, Michael Bolton, Mariah Carey and Taylor Dayne to name just a few. 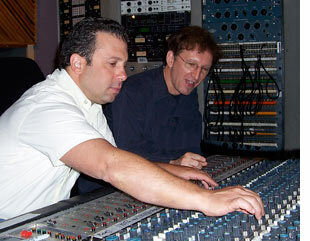 As a composer and producer of music and audio for television, film, radio, corporate and advertising Spyros' music and audio work has been heard on: Dateline NBC, CBS 48 Hours, The Olympic Games, Northwest Airlines, The Tonight Show with Jay Leno, MTV, 1-800 Flowers.com, FOX News, Martha Stewart, Access Hollywood, Inside Edition, Anarchy TV, Americas Most Wanted, Maury Povich and many others. Logic Music Inc. and its production staff can accommodate all aspects of audio and music production, recording, editing, mixing and mastering. The music styles that we have been contracted to produce and record span many genres including singer/songwriter, rock, pop, jazz, international, ethnic/world, instrumental and vocal jazz & blues classical, dance music, R&B and rap. Spyros and Logic Music have generated a reputation for excellence producing vocalists and their material. Spyros is well known for extracting and encouraging the best from performers in their recordings and performance. The production company and staff excel at providing arrangements and productions that inspire artists to push and expand beyond their own perceived limits and rise to the occasion in performance and on stage. As producer and engineer, Spyros is sought after as a result of his recording history, reputation and results on record. His efforts and achievements have earned him awards and critical acclaim in many areas of the music and entertainment industries. Whatever the musical or audio task, Logic Music Inc. can produce results. Please contact the Logic Music production office to discuss the details of your project and audio needs. Spyros Poulos is an exceptionally creative musician. He produced and arranged a couple of songs I had written for artist projects he was working on, and did an amazing job. His command of the studio as an engineer, arranger, keyboardist and producer is outstanding. He's the real deal. Spyros is a great musician and his ears can be trusted and relied upon to produce the highest quality product possible. I highly recommend him to be at the helm of any top notch, important project in any style, genre or application. Spyros is a highly motivated professional who is entirely immersed in every project he produces. He goes way beyond the call of duty bringing a wealth of knowledge and talent. You can always count on his unique skills and his work ethic to make your project a success. My experiences working with Spyros Poulos and Logic Music have all been wonderful. Some of my most cherished memories were created during our recording project together. Spyros is someone who truly knows how to bring out the best in an artist. His passion for music can be heard and felt in his productions. Like a coach who "knows you've got it in you," he encourages people to give their all without sacrificing the fun! The end result is always stellar, as he has a gift for capturing the essence of emotions in musical form. I highly recommend him as one of the best producers I have ever worked with."